This is the only banking institution that issued money in Amherst, Ontario. Because of that fact, these notes are needed if you want to complete an entire city set. Bank notes were printed for the five shillings, ten shillings, and twenty shillings denominations. That equates to one, two, and four dollars. These notes can be dated as 20th January 1836 or 15th February 1836. The fact of the matter is that any bank notes from this bank are rare. The bad news is that due to the plain and colorless design this series is not very popular. The backs are completely blank. Many collectors would rather have something more colorful with interesting vignettes, even if that means settling for a more common bank note. This bank also never officially got a charter. So it is in kind of a gray area in terms of classification. You are most likely to encounter the 20 shillings note. Surprisingly enough, the five shillings denomination is the scarcest. Contact us for exact pricing information. We are buying. 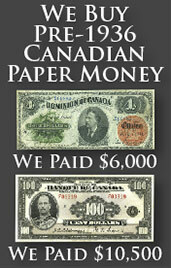 We buy all types of Canadian currency. 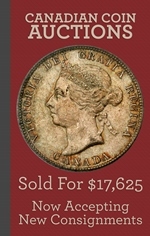 We are especially interested in bank notes from The Newcastle Banking Company in Amherst. You might be surprised at how much money we can offer for some currency. Send us an email with pictures of the front and back of your bank note and we will respond quickly with our offer.